BCDB Rating: 4.6/5 Stars from 43 users. This page has been viewed 61 times this month, and 9042 times total. Cartoon Characters: Chihiro/Sen, Haku, Yubaba, Father, Mom, Aogaeru (Assistant Manager), Bo, Rin, Bandai-gaeru, Kawa no Kami, Chichiyaku, Aniyaku, Kamajii. English Version: Chihiro/Sen, Chihiro's Mother, Yubaba, Zeniba, No-Face/Frog, Chihiro's Father, Lin, Haku, Aogaeru (Assistant Manager), Kamajii, Bôh. 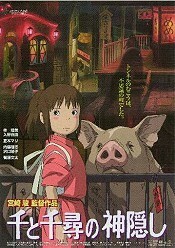 Directed By Hayao Miyazaki, Masayuki Miyagi, Atsushi Takahashi, Kirk Wise. Written By Hayao Miyazaki, Cindy Davis Hewitt, Donald H. Hewitt, Linda Hoaglund, Jim Hubbert. Music: Joe Hisaishi, Youmi Kimura, Shin-Nihon Firuhāmonî Kangengakudan. Editor: Takeshi Seyama, Kyoko Mizuta, Mutsumi Takemiya, Megumi Uchida. Originally Released on July 20, 2001. 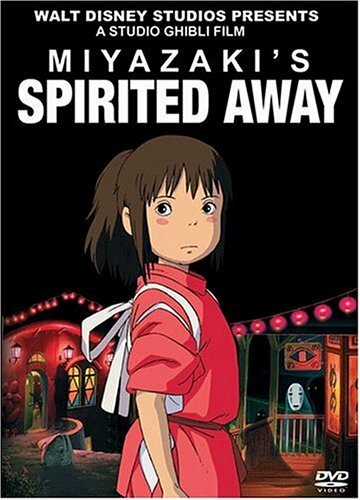 "Spirited Away," "The Spiriting Away of Sen and Chihiro," "Sen," "Sen and the Mysterious Disappearance of Chihiro." You can watch this cartoon today on your computer. Just click below to start viewing "Sen To Chihiro No Kamikakushi" online now. Do you have anything to add to this page? Have we made any mistakes... or do you have any additional information about Sen To Chihiro No Kamikakushi? If so, we would love to hear from you. Please send us a quick note with your additions or corrections to this page, and we will make the corrections as soon as possible! Below are comments about this cartoon submitted by people who have seen this show. Take a look and see what others have said about Sen To Chihiro No Kamikakushi. We want to know what you think, too!! Feel free to share your own opinion- we do want to hear from you! You can add your own comments here. Perfect, for anyone and everyone! A Japanese 'Alice in Wonderland'. Sen To Chihiro No Kamikakushi by Big Cartoon DataBase is licensed under a Creative Commons Attribution-NonCommercial-ShareAlike 4.0 International License.